First of all, greetings to all of you! I'm new to the forums, yay! Second, I've recently been thinking of a game I played as a kid in my Famiclone (my first console) that I now realize was a DKC2 bootleg. It was not the Super Donkey Kong 2 most people are familiar with, it was very different. It actually featured Dixie, but instead of both Kongs being on screen at the same time, they'd just "transform" into each other when you pressed select. It also had tons of worlds and levels, even some of those balloon levels and quite a few very hard water levels. It also had some bosses that were rather hard to fight given the clunky controls, but I digress. I searched far and wide on the Internet, even in the second page of Google, and found nothing. 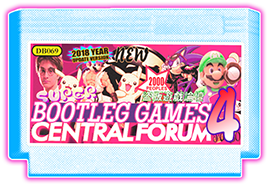 The Bootleg Games Wiki does not list it either. I wonder if it is just a very, very rare game that never got dumped. If it's any help, I'm from Brazil, so it may be that this bootleg only existed here? I dunno. Honestly, that's new to me, I haven't heard anything like that. You wouldn't happen to remember what the cart looked liked? This is definitely a game i'd like to see resurface. What was the name of your Famiclone? If I remember correctly, it was basically a regular yellow cartridge, with a very clear picture of Diddy Kong and Dixie Kong, each on one side of the Donkey Kong logo, with "Diddy's Kong Quest" written under it. I'm not sure I remember exactly, but that is what I can remember. I don't remember there being any sticker on the back of the cartridge, however. It was one of a few dozen Famiclone models that were around back in my day in Brazil. It was called "Mega Power", and was manufactured by a company called "NEO" or something. It was black, came with a blue light gun and two joysticks that were shaped and styled after Mega Drive/Genesis joysticks. 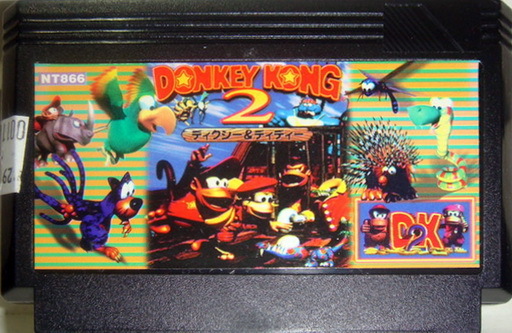 The DKC2 cartridge was not included in the console, however. It was bought in retail for cheap. I was eventually gifted a used Sega Master System by my cousins, and my parents gave my Famiclone away, alongside all of its cartridges. I don't know who has it presently, unfortunately. That was more than twenty years ago, so chances are it is gathering dust in someone's basement by now. EDIT: I found a picture of the console in a Greek website! I'm not sure, it's been too long, but I'm pretty sure that "Donkey Kong" was written in full rather than abbreviated.